Homeschool on the Croft: Chats on the Farmhouse Porch. 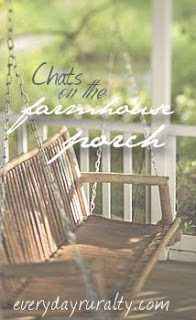 Patrice has changed her Wednesday's Words of Weightloss to Chats on the Farmhouse Porch. This suits me much better because chatting is something that comes kinda naturally to me. I don't know if any of you ever noticed that before. Mmm, this is difficult because I love potatoes. I do love a potato gratin. I love new potatoes par boiled, then chucked in a hot oven with some olive oil and black pepper, then mixed with crispy fried bacon. I can't stand it if I'm eating out ... er, yes, it does happen. Well, it's been known to happen.... and I am served a lovely meal with only a tiny portion of tatties. Yep, I love potatoes. When was the last time you were at a playground? Oh boy, I haven't a clue. Seriously, I just don't know. I'll have a think and maybe come back on this one. Do you do any needle crafts or sew? Not really. When the World Cup was on last year, I began knitting some squares to make up a blanket... I love football (soccer! ), but sitting watching matches night after night would have made me feel a tad guilty, I reckon. So I began to knit - and knitting squares allowed me to concentrate on the game and still not go wrong. I crocheted the squares together, and the (almost!) finished blanket now sits in a corner, probably waiting for next year's Olympics for its final touches! Who was your favorite adult, outside of you family, when you were a child? When I was wee (as opposed to now, when I'm, er, still wee...), I used to go to a playmate's house. Her dad was a minister in our district, but I knew him primarily as 'Shona's daddy'. He was the kindest and nicest 'daddy' (except my own) I knew. Later, he became my minister, and as well as being my pal's daddy, he became, under God's hand, the feeder of my soul. I have now known him almost all of my life, and he is still one of the most consistent examples of a Christian I have ever met. Definitely not anything with a barbecue sauce, or mushrooms. Anyone else out there think mushrooms weren't really meant to be eaten. I know we mustn't say Bleugh to any food, but... mushrooms? .... Bleugh. Well, that gave all my dislikes! I do like cheese, chicken and maybe something spicy. If I was on Patrice's porch, I'd probably talk about the weather. I'd begin by saying how much I was loving the heat. I'd probably tell what our weather at home was like, and how wonderful it was to be able to have a porch and to be able to sit out in the warmth. Then, I'd begin to overheat. And I'd head for the air conditioned inside. I'd wonder how anyone is able to work outside. And then I'd think of the farmers, struggling in extreme heat and in terribly dry conditions. I'd feel so awful for moaning about my weather when farmers, whose livelihoods depend on rain, really do have reason to be anguished. And then I'd feel even worse for my complaining when I'd think of livestock farmers. Imagine seeing, not only your livelihood, but your animals suffering. Reading about the heat killing turkeys at the Banks of Squaw Creek is heartbreaking, and reading on PW's blog of farmers in Oklahoma having to sell their livestock because of drought conditions really does put things in perspective. Although my 'complaints' about our weather are only lighthearted and aren't really serious, I am rebuked for this: how seldom I truly give thanks for the weather we have here, for how easy it is to warm our homes, and to put on an extra layer of clothing; for the fact that our vegetables do at least (mostly) grow; and that our animals do not have to withstand extreme heat or cold... and the wind doesn't seem to bother them too much. So much to be thankful for, and today my thoughts are with those who are really struggling because of the weather. I don't like mushrooms either. YUCK!! They are FUNGUS!!! But I do like pepperoni :)! I wish you could send some cool, wet weather our way. We are hot and dry in Missouri too! And yes, sometimes I am not NEARLY thankful enough to our Lord for ALL the good things He has given me. And, by the way, I love potatoes too :)! So glad to sit and talk with you "one the porch"!! HOPE you have a great rest of the week! Thanks for participating! I agree with you about pepperoni, but I am a mushroom person. Shh! Don't tell anyone. We have had a cooler week this week, but last week was so very hot. We lost 30 chickens to heat that week. I hate when the animals are affected by the weather. Nice visiting with you on the porch. I have to go in now...the mosquitoes are getting to me. It always puts it into perspective when we see how someone else lives or suffers. I think this is God's way of bringing us down a notch. My husband absolutely loves mushrooms. I'm okay with them, but I personally I think they taste like cardboard. It's interesting; they are little food leeches. They feed on the flavor of all the other foods you are cooking. So, essentially, your tasty food is what makes mushrooms taste appealing. Yes Oklahoma and Texas are getting hard hit with drought. Thanks for your prayers and kind words. Just a couple of days ago we were talking with a fellow farmer that had been to the salebarn and he said they're having to turn people away because their pens are filling up so quickly. It is sad for those that can't even get seed in the ground/dust as the wind just blows it away. Again, thanks for the prayers! Now, I'm going to try and post this comment and say a little prayer that it "posts" :-).